SDI - Personal Strengths Romania | What is SDI? The SDI is a powerful tool for all levels of an organization. The critical insights it provides enable leaders and team members to better understand how to influence people who think, behave, and communicate differently. As jobs become more complex and strategic, social and emotional competencies have become key differentiators for success, particularly for leaders. As people are promoted to more senior roles, their performance is measured not only on bottom-line results, but also on how they manage their relationships with key stakeholders. The SDI helps leaders at all levels focus on how they communicate and work with one another and how they use individual and team strengths in light of their business needs. It's a fast, fun relationship building tool - for everyone. Strength Deployment Inventory (SDI®) is a powerful, self-discovery inventory for enhancing your ability to transform your workplace, your relationships and your life. SDI® assists people to appreciate diversity, communicate more effectively and handle conflict more productively. Unlike other personality assessments, the SDI® goes beyond behaviour to identify the motivation behind behaviour — answering "why" individuals act the way they do. It becomes easier to accept another person’s actions when you understand their motives, intention and then their behaviour. 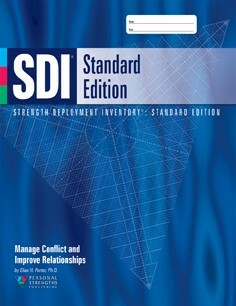 The SDI is available in English and Romanian.